What clip can I use to connect to this [specsheet] SPI flash chip in a DIP8 package? 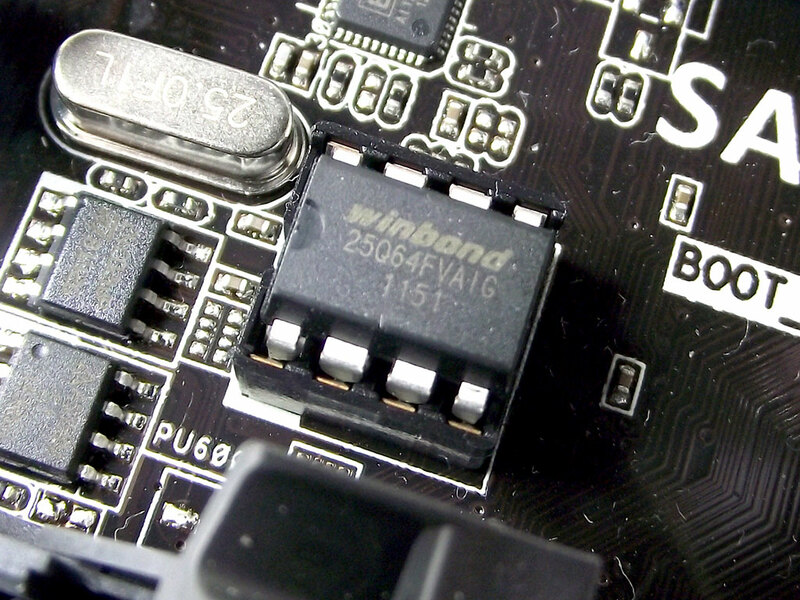 note: this picture is of a motherboard that belongs to someone else, but mine has the same manufacturer, model-family, and Winbond 25Q64FVAIG. Only the third line (date code?) is different. The surrounding circuitry appears identical. I'm under the impression I can't use a SOIC8 clip to connect to a DIP8 package. I'm seeing a large number of clips labelled both SOIC8 and DIP8 (1, 2) - one with a description saying "clip onto any 8 pin SOP, SOIC or DIP package." You are correct, the pin pitch is different so you'd need a dedicated DIP clip or a dedicated SOIC clip. I think the description for that product may be misleading. EDIT: The chip is socketed so you can carefully pry it up and program it outside of the circuit, like on a breadboard. This is probably what's best unless there's a dedicated header on the board for in-circuit programming. Taking it out of the circuit removes ambiguity as you can control what it's connected to. You won't need a test clip anymore either. Not the answer you're looking for? Browse other questions tagged spi isp icsp soic or ask your own question. Will my circuit interfere with ATtiny25 in system programming?